Parramatta’s Altitude Towers, Docklands’ Banksia and Brisbane South City Square among some of the winners from the Urban Taskforce Australia’s Development Excellence Awards that were handed down at a dinner last week. Altitude is a dual tower development that included 629 units across a 170m, 53 level ‘West’ Tower and a 128m, 39 level ‘East Tower located on the banks of the Parramatta River with a street frontage to Church Street. The development includes both serviced apartments and private apartments as well as a child care centre and several eateries and drinking establishments. The building topped out in January 2017. The Urban Taskforce Australia, a non-profit lobby group that represents developers and equity financiers and primarily focused on the development scene in Sydney, has long drawn a distinction between design regulations in NSW and Victoria(link is external), even going so far as to say if Victorian standards were applied in NSW, it would save Sydney buyers $150,000 when making an apartment purchase. Pellicano and Perri Project’s South City Square in Brisbane took out the award for top Mixed Use Development which includes hotel suites, 860 apartments and 13,000 square metres of retail space and a new public square. 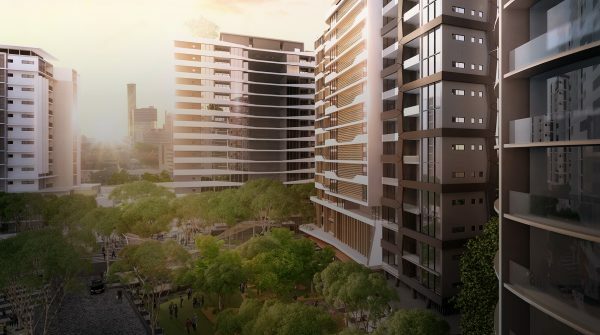 Located at the intersection of Logan Road and Deshon Street in Woolloongabba, South City Square has completed stages 1 and 3 with stage 3 due to be complete by early 2019 and the site is located within a 1km walk of the fuiture Woolloongabba station to be built as part of the Cross River Rail project. The jury for the Development Excellence Awards included Peter Poulet – NSW Government Architect, Carolyn Cummins – SMH journalist, John Wynne – Urbis, John Ferrarin – Quantity Surveyor and David Tanevski – Secretary-Treasurer UTA.